Frain Industries carries used palletizers from many OEM manufacturers including: ABB Automation, Adept, Advance Lifts, Allen, Alvey, Automated Production Systems, Busse Brothers, Chatland, Columbia, Currie, FMC, Kinetic, Meridian, Mollers, Ouellette, RMT, Seco, Slidell, Top Tier Inc, Uni-Pak, Von Gal, Whallon and many others. Klippenstein, Model CSK894, pallet stacker. Equipped with a 41" Wide x 48" Long x 48" High pallet stacking section, 72" long (2) chain infeed conveyor extending 12" past frame with a 34" infeed height. Okura Model A1600, single robotic, (4) axis, pick and place palletizer arm rated up to 1,600 bags or 1,100 cases per hour – depending on materials and application. Equipped with vertical multi-articulated, polar cordinate system. Maximum load capacity: 140 Kg. Operating range: R-axis (rotation) 320°, D-axix (up/down) 60.7", O-axis (forward / back) 92", T-axis (wrist) 440°. Maximum height: 2,474mm, with single case style clamp effector end. Remote control panel with A/B PLC controller and touch pad has main power and motor power on/off with start, stop, e-stop controls. Mounted on heavy duty (4) leg base frame. with cage style safety guarding and roller in feed and discharge conveyor sections. Fanuc, Model M-410iHS, 4 axes robotic, servo, vacuum, pic-n-place palletizer arm. Rated from 5 to 15 cycles per minute – depending on materials, application, pack pattern and machine configuration. Unit is cable of moving product between floor level and 123" in height and rated to pick up maximum weight of 220 lbs. Equipped with (1) 18" x 44" (52) suction cup vacuum head mounted on a robotic arm with a 78" horizontal reach. Fanuc R-J3 model controllers with hand held to each pendants. Mounted on pedestal base frame. Currie Model LSP5, automatic, compact, high level, full case palletizer rated from 10 to 35 cases per minute – depending on materials and application. Maximum case size: 24" in Length; 24" in Width; 18" in Height. Pallet size range: up to 50" in Length; up to 48" in Width. Maximum load height: 72". Weights: up to 4,200 lbs per load. Equipped with empty pallet dispenser with 12 pallet capacity, metering belt infeed, an 11’6" long x 30" wide in feed conveyor, with bump wheel case orientation, case layer accumulation section, layer transfer section, 70" long x 48" wide discharge conveyor with a discharge height of 22". Control panel with PLC and push button operator controls. Columbia Model FL100, low level, full case palletizer rated 5 to 12 cases per minute – depending on materials and application. Case size range: up to 22" in Length; up to 16" in Width; up to 18" in Height. Load capacity: up to 48" in Length; 48" in Width; and 65" in Height with skid. Weight capacity: up to 600 lbs per tier; and 3000 lbs per load. Equipped with 12 capacity empty pallet magazine that accommodates pallets from 40" x 40" to 48" x 48", powered roller case in feed conveyor, orientation and layer former, pallet loading section with pusher bar and discharge conveyor. Control panel has A/B PLC and safety guarding. Columbia Model FL100 Low level, full case palletizer rated 2 to 12 cases per minute – depending on materials and application. Case size range: up to 22" in Length; up to 16" in Width; up to 18" in Height. Load capacity: up to 48" in Length; up to 48" in Width; up to 65" in Height with skid. Weight capacity: up to 600 lbs per tier; up to 3000 lbs per load. Equipped with 12 capacity empty pallet magazine, that accommodates pallets from 40" x 40" to 48" x 48"case in feed conveyor, orientation and layer former, pallet loading section with pusher bar and discharge conveyor. Control panel with A/B PLC and safety guarding. Whallon Model Vacuum Head Pail Palletizer, automatic, 2 to 6 gallon vacuum load, pail palletizer rated from 5 to 24 pails per minute – depending on materials and application. Equipped with dual empty pallet magazines with 120" long x 48" wide chain fed pallet shuttle conveyors, over head 48" x 54" vacuum head pallet pic-n-place able to pick from either pallet magazine or pail in feed conveyor, with loading bar, pail accumulation bed and roller discharge conveyor. Control panelhas A/B PLC with panel view controller and statis light bar. Uni-Pak semi-automatic, low level, hand load palletizer, with number of product and pallets per hour – depending on materials, application and operator dexterity. Equipped with 44" in Width; 54" in Length hand loading bed with layer up load hoist and stripper plate. 40" in Width; 60" in Length dual chain pallet load area and discharge conveyor. Control panel with A/B PLC, swing arm digital readout and is fork lift able. Alliance Inc. stainless steel pallet stacker. Equipped with a 41" Wide x 40" Long x 48" High pallet stacking section, 120" long (2) chain infeed conveyor extending 78" past frame with a 37" infeed height. Pallet stacking section equipped with a 37" x 27" scissor lift plate and (4) weighted pallet grippers to hold stack. Klippenstein, Model CSK894, pallet stacker. Equipped with a 41" Wide x 48" Long x 53" High pallet stacking section, 72" long (2) chain infeed conveyor extending 12" past frame with a 34" infeed height. Fanuc, Model M-410iHS, 4 axes robotic, servo, vacuum, pic-n-place palletizer arm. Rated from 5 to 15 cycles per minute – depending on materials, application, pack pattern and machine configuration. Unit is cable of moving product between floor level and 123" in height and rated to pick up maximum weight of 220 lbs. Equipped with (1) combination finger gripper / suction cup vacuum head mounted on a robotic arm with a 78" horizontal reach. Fanuc R-J3 model controllers with hand held teach pendants. Mounted on pedestal base frame with light curtain safety. Slidel, Model SDP 2010, automatic, bag palletizer rated from 5 to 20 bags per minute – depending on materials and application. Pallet size range: 36" x 36" to 48" x 60" with maximum load height of 74" including pallet and maximum pallet weight of 4000 lbs. Capable of handeling most type of bags, up to 100 lbs; made of paper, plastic, or poly woven materials. 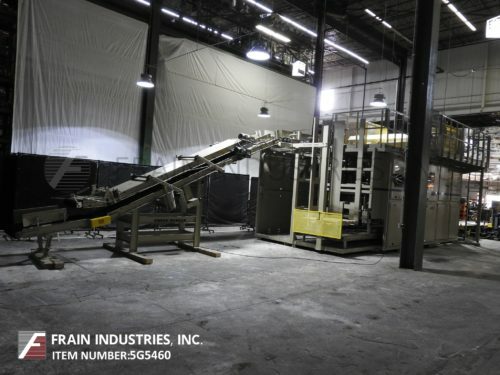 Equipped with empty pallet and slip sheet dispensers, 204" long x 48" wide plastic mesh in feed bag accumulating conveyor, with 48" long x 20" wide pacing conveyor, to 150" long x 20" wide inclined bag flating conveyor, to top bag pacing and push up orientation conveyors with accumulation and layer squaring system, bag pusher bar and pallet load stacker. Control panel has A/B controller with touch pad controls and panel view. 60" long x 48" wide steel mesh and 108" long x 48" wide roller, full pallet discharge conveyors.